December is the perfect time to enjoy the bounties of the harvest as we celebrate the holidays with our family and friends. This year for our Christmas dinner, I’m making Christmas Salad with Poppy Seed Dressing. 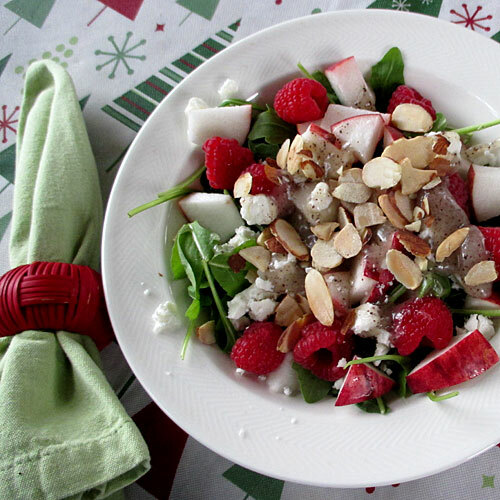 It’s a beautiful salad: arugula (or spinach) topped with fresh raspberries, toasted almonds, Belle de Boskoop apple chunks, and feta cheese from Appleton Creamery. I know that fresh raspberries are a luxury, but some meals are worth it! When friends come for cocktails, we’ll treat them to batches of fritters with Rabbit Hill Tartar Sauce and Cranberry Ketchup. Right now, a pot of Beef and Barley Stew is bubbly on the hearth. All delicious, and all with Maine grown foods. This has been a learning year for us here at the kitchen. Our family business has faced both challenges and opportunities. We count our many blessings. My thanks to all of you for joining our family and supporting Maine agriculture. At the Harvest Festival Todd Simcock and I prepared both corn and clam fritters, and sampled them out to folks with apple and cranberry ketchups. He was impressed at how easy it was, tasty, and healthy. A new fan of Maine wheat is born. Fritters are often sold as a street food, eaten with the fingers and dipped into sauce. They make a great party food. We enjoy them even more often now that I have Fritter Mix in the pantry. “I cannot get by without Poppy Seed Dressing though I’m personally tired of it,” wrote Helen Corbitt in 1974 book, “Helen Corbitt Cooks for Company.” Early in my culinary career as a new chef and caterer, Corbitt’s recipes and cuisine inspired countless coffees and brunches, buffet suppers, cocktail parties, and elegant dinner parties. Poppy Seed Dressing is delicious on practically every kind of fresh salad, and really highlights fruit. It’s the flavor combination of tart, sweet and savory combined with the texture of poppy seeds that make this dressing addictive. When I shared this recipe with folks in my column, I wondered if perhaps I could find a way to put this product in a jar. This is the first trial run, and I’m really interested in your feedback. Although this product may never go to the retail shelf, your input helps me in my research as I continue to develop Maine products that consumers trust and enjoy. How did your family enjoy the Poppy Seed Dressing? Any particular combinations of fruit and veggies that you liked that could be shared as a recipe? About 24 hours after bottling, the dressing separated. Does this bother you as a consumer? Using food science, there are a couple of ways to prevent this, either with a gum or additive, or perhaps using equipment that emulsifies the product longer. Would this be necessary for you to purchase the product? Which method would you prefer? Yes! We can and do reuse and recycle jars and boxes. The shiny labels will peel off quite easily if they do not get wet. So peel, and then wash. Please leave boxes and jars at your CSA pick-up location. Thanks!